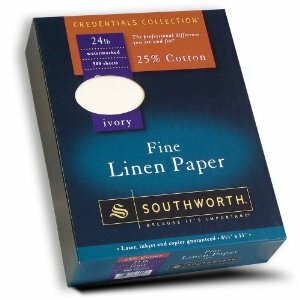 Southworth Fine Linen Paper - 25% Cotton gives your documents that 'something extra'. Lovely linen finish. Color White. Intended for a variety of printing needs: business documents, letterheads, correspondence, resumes, announcements, legal documents, presentations, and more. 25% Cotton, 8.5 Inch x 11 Inch, Watermarked. 24 LB, Ivory, 500 Sheets. 55% Recycled content with 30% Post-Consumer Fiber. Remember to use matching 25% Cotton Southworth Linen Envelopes.